PHILIPSBURG, St. Maarten -- The Nature Foundation is recommending that the invasive lionfish not be eaten or consumed based on a recently concluded study where flesh samples which were taken of larger lionfish caught in St. Maarten waters showed levels of the poisonous ciguatoxin which causes Ciguatera poisoning. Ciguatera poisoning is caused by naturally occurring toxins, called ciguatoxins, which are produced by microscopic plants - gambierdiscus toxicus - that live on seaweed and other surfaces within coral reef communities. When fish eat seaweed or algae they consume the organisms and the ciguatoxins build up in the fish's flesh. The toxin is stored in the fishes' body and not excreted - so it builds up as it goes up the food chain. The bigger fish eat the little fish and the toxin gets passed on until it is consumed by humans. Predators at the top of the food chain - like barracuda and lionfish - can end up with large amounts of the toxin in their flesh. No test can be done to determine if the fish is poisoned and cooking and preparation have no affect on the toxin. 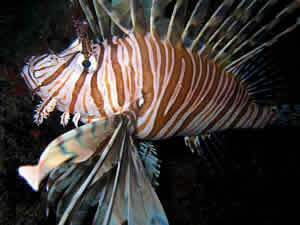 The toxin is unrelated to the venom found in the spines of the Lionfish. "This is very bad news for us as we were planning on promoting lionfish as an edible, commercially viable fish which we hoped would help in reducing its numbers along the reefs. However, before we started telling the community that the fish is edible we wanted to be absolutely sure that there were no health care threats associated with eating the fish. With our partners in the USVI and in the French Islands we tested several samples of lionfish meat and have found that unfortunately an uncomfortably high percentage showed the presence of ciguatoxin in the meat. Therefore we do not recommend that Lionfish be eaten. This is the same toxin which is present in the flesh of Barracudas, large Jacks and large Snapper, which are traditionally also not eaten if caught in our waters. Various countries and territories in the Caribbean have been promoting lionfish as edible. However these areas usually do not have a high level of ciguatoxin in their larger reef fish. The North Eastern Caribbean from Guadeloupe to the Virgin Islands, including St. Maarten, have a higher level of ciguatoxin than most other areas in the Caribbean. So to be absolutely safe rather than sorry, we unfortunately can not recommend the eating of lionfish as a method for controlling them," commented Tadzio Bervoets, Nature Foundation Manager. Ciguatera poisoning or fish poisoning as it is also known causes nausea or vomiting, diarrhea, electric-shock-like or painful sensations, reversal of hot and cold sensations, intense itching or tingling fingers and toes, slowed heart rate and a drop in blood pressure, weakness or fatigue, muscle or joint pain, depression, and headaches. There is no effective treatment or antidote for ciguatera poisoning and the mainstay of treatment is supportive care. The lionfish is an invasive species which was introduced into the Caribbean through the aquarium trade. The fish is a threat to local fisheries because they have the potential to destroy local fishing grounds and the economies which depend on them. The lionfish is also a venomous species which can inflict a dangerous sting; therefore the Nature Foundation requests that if a lionfish is spotted to please contact the Foundation at 5444267. Contradiction maybe? "No test can be done to determine if the fish is poisoned and cooking and preparation have no affect on the toxin. The toxin is unrelated to the venom found in the spines of the Lionfish." Then you say. "With our partners in the USVI and in the French Islands we tested several samples of lionfish meat and have found that unfortunately an uncomfortably high percentage showed the presence of ciguatoxin in the meat. Therefore we do not recommend that Lionfish be eaten." How do you test the meat, when there is no test available??????? The solution is to eat the small ones and turn the biggies into fertilizer. @Stephen I think they mean for the average person there is no test for ciguatoxin. A chef can't tell, but a laboratory can. Actually, the invasive lionfish was introduced to Caribbean waters when a hurricane demolished a building. The Large display aquarium with show sized lionfish shattered releasing the fish into the flood/surge. This is why there is one species of lionfish involved. Don't know if this is true or not, but when I was living in PR they recommended having one cent penny and place it in the mouth of the catched fish (alive). If the cent started to turn green it "had" ciguatera poison. Again, this might be one of those urban myths. Would be good to see if there is any truth on this info. I have known all my life that you could not eat lion fish my uncles larry and jake and roy clifton told me that.People think oh well if its alive I can eat it,what they going to eat up the whole one not one species is safe. Thissssssss wassssss sooooooo useful ! ! ! ! ! !